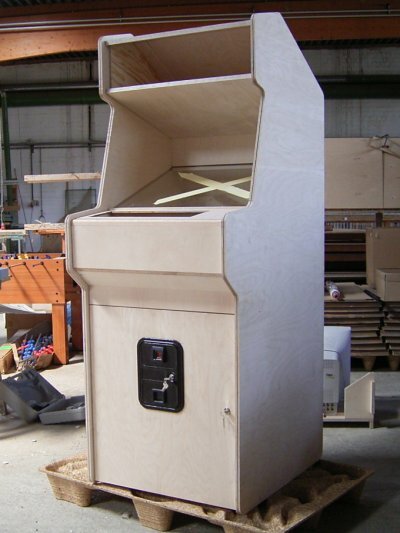 The cab is a reproduction of a Q*bert machine build in 1982. I took the measures from jakobud.com, a great site which seems to be currently offline. After i made a cardboard model, i saw that the original size was too small for me. In my memory the cabinets were pretty big back then, but maybe that's because i was a lot smaller. 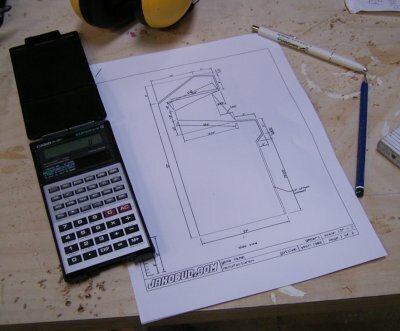 For better ergonomics i multiplicated all numbers with 1.125, so the cabinet is 72" instead of 64" tall. The surface of the control panel is 42.75" instead of 38" form the floor. - Interchangeable control panels. In addition to the Q*bert panel with only one 4-way joystick, there will be one with to joysticks for two player action and one with a keyboard and trackball for configuration and pc-games. like Chromium and Clanbomber. - The front side, which contains the coin rejector, will be hinged for easy maintenance and to have a place to store the two control panels not currently used. The material i use is 18mm multiplex birch. This material is easy to work with and unlike MDF it is very robust while lightweight. Initially i planned to use HPL (High Pressure Laminate) for the surface, but my supplier couldn't deliver the right q*bert color. So i just use a coating of synthetic resin paint. For easier transportation, all parts can be disassembled.